Travelling can be both exhilarating and hazardous to one’s health all the same time. Was it Mark Twain who said that life is either a daring adventure or nothing at all? Yeah, he would be right at home in our house or rather our travel trailer! This morning I awakened at 11:30 a.m. delighted to have slept in after a wretched night. Steve was arriving home to the tin can ranch after the closing meeting of his United States Canoe Association (USCA) annual meeting. He was energized beyond his lack of sleep, ready to hit the big water off the coast of Florida. A few bites of ham was all he needed: the outrigger canoe strapped to the roof of my truck for the past 1000 miles would see water at last! A blast of seizures delayed my plans for breakfast as Steve assisted me with a bite to eat and trip to the bathroom. Then he found a deer tick on his back! We had hoped that the dangerous hitch-hiker was a loner but that was not to be. Within an hour we had found about a dozen on his clothing and the floor around the camper entry. Quickly we searched and cleaned, flashlights in hand until every inch of Steve, the dog, and our home away from home was cleared. [Some parts of the search weren’t too bad! ;)] At last I collapsed again, this time into a pile of tears: why does everything have to be so difficult all of the time? Steve is a saint, this is true. He quickly switched gears (and clothing!) for the paddling adventure that awaited him at Amelia Island State Park with a fellow paddler in from Arkansas. I sent along two bars of chocolate from our hometown chocolatier to thank him for waiting for Steve plus Steve’s lunch that I had quickly assembled. At last I could ravenously consume my makeshift breakfast of thawed lunch meat, canned green beans, ghee butter, and pumpkin seeds: low oxalate on-the-road dontcha know! Steve soon departed after pumping up the tires of my bike for me: a tag-a-long I’d added in hopes of riding here in the warmer weather . . . But I was just too tired to do anything but eat and check Facebook after my beloved departed. Oh how I longed to be with him! Someday soon we will again bring the tandem outrigger canoe (OC-2) on such trips so I may join my River Bear on the water. Yes, Lord: maybe this year? Instead Don and Steve will take turns paddling the OC-1 and have a blast surfing the ama (which is the float attached by two poles or iakos off to one side) and waves like true racers. Meanwhile I grabbed the remainder of my bag of organic popcorn and prepared to return to my own version of life these days in my pretty bed. And in due time, I did revive. It’s raining now as this blog comes to a close. My bike is at the ready, leaning against my inner left leg, with my beloved pup feigning off sleep on the floor just beyond my outer left leg. O.K. so we are now also initiated to winter camping with way too many toys! Funny how I don’t regret hardly anything about how we crafted this trip. Most of the delegates stayed at the hotel where the USCA meeting was held and that certainly would have been more convenient than the RV park we ended up at which was a 25 minute drive north in Georgia. The air was stale to me at the Hampton Inn with the stale scent of air freshener in the lobby. Here amidst the palms we have fresh air ALL DAY and ALL NIGHT LONG! I like that! The rain dries up quickly anyways in the reddish soil sprinkled with pine needles. We will avoid the tick path my hubby took with the dog this morning, no problemmo. Here I can even see a few stars at night peeking through the overhead vents we keep open at night. That’s refreshingly cool and very romantic too! I could be at home right now in the frigid Midwest, writing my heart out amidst the foot of snow around our home and subzero temperatures. This is better. This is good. This is what living a life of adventure is all about. Why wait for a “rainy day” when everything will never be perfect enough to do the things which call one forward TODAY. This IS that rainy day. And hey, the rain just stopped! I do believe I have carb-loaded adequately too! Where is my bike helmet anyways? Seeya pup. Ima hittin’ my own road ya all . . . Loved this, Julie. I am so glad God has blessed you with your RV. You have been blessed. And the adventures, what fun. Keep smiling dear friend God has your back. 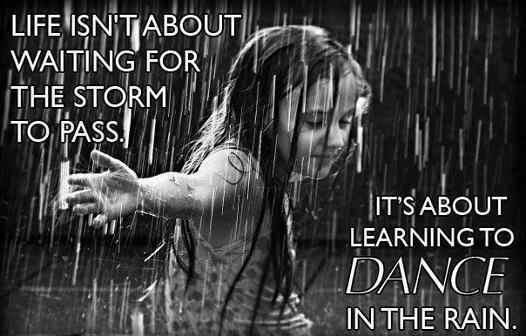 Just keep dancing! You go girl! Glad to there’s popcorn in the bed rather than the tick!